Steve Lindsey, CEO and Founder of Lontra. 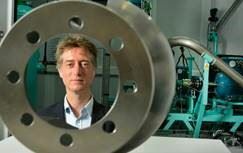 A consortium led by European technology developer Lontra has been awarded a £1.5 million grant to apply its Blade Compressor technology to increase the fuel efficiency of engines used for 1MW power generation – the most common size of generator used for applications ranging from data centres to manufacturing plants. The project will apply Lontra’s Blade Compressor as a turbo compounding technology. The Energy Catalyst grant from by 'Innovate UK' provides full funding to take the technology from concept through to hardware and testing stages. The Blade Compressor, is a compact double acting rotary compressor aimed at industries such as water treatment and industrial compressed air. It is best imagined as a piston and cylinder, but with the cylinder wrapped into a ring doughnut shape. The design involves a constantly open intake port, without valves. As the piston rotates, air is drawn in behind it and compressed in front of it in an almost continuous cycle. Blade Compressor has a oil-free geometry providing internal compression with low leakage and low inlet and outlet flow losses. A low pressure (1Bar/15psi) Blade Compressor has already been proven in a demonstration with Severn Trent Water, where reductions in energy consumption of over 21% were observed. The technology is now licensed for production within the municipal and regulated waste water sector to Sulzer. The multi-million pound deal will see aeration equipment incorporating Lontra’s technology sold across 150 countries.